The Puerto Rican Cuatro is the national instrument of the island of Puerto Rico commonly used to interpret jíbaro music (peasant or mountain-dwelling music) or traditional Puerto Rican music during the Christmas season. History has linked the Cuatro very firmly with the jíbaro folklore and festive musical genres typical of Puerto Rican costumbrism. That said, the Cuatro is an instrument with great capabilities and infinite musical possibilities that have not yet been explored to its vastness. With the purpose of investigating the instrument’s capacities and making it shine in an unusual but undeniably compatible environment, this Concerto for Puerto Rican Cuatro and Strings Orchestra is born. This concerto, traced in 3 very contrasting movements and highly demanding for the Cuatrista, travels through the amplitude of the Cuatro in its light as an absolute instrument. The treatment of the Cuatro in this concerto is oriented to show its suitability and skill as a concert instrument in the world of classical music. In this concerto, the Cuatro departs from the folkloric restrictions in which it has been cornered and accomplishes a journey driven by musical motives, technical challenges and moments of high emotion, passion and sentiment designed exclusively for the Cuatro, thus showing its indisputable aptitude as a concert instrument in the classical music world. This work was commissioned by Musica de Camara, Inc. – New York City. premiere: Concierto para Cuatro Puertorriqueño received its premiere on May 19th 2017 by Luis Sanz, cuatro and the Música de Cámara Orchestra under the baton of maestro Roselín Pabón in the El Teatro Concert Hall from the El Museo del Barrio in the legendary Museum Mile in New York City . 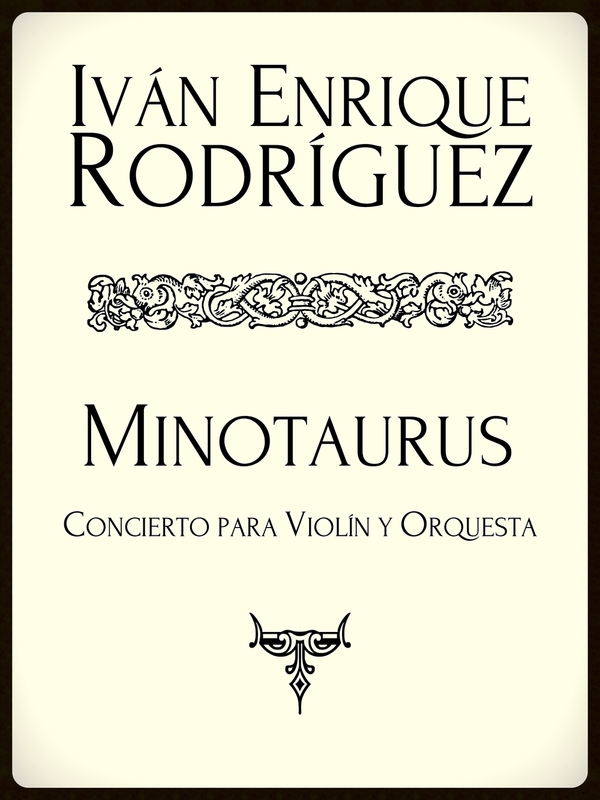 Minotaurus is a concerto for violin and orchestra inspired by the Greek myth of the Minotaur. Written in the traditional three movements, each of these is used to describe the various events that take place in the myth. The Minoan Palace of Knossos, the first movement, begins the tale as King Minos, king of Crete, learns of his wife's infidelity with a bull which resulted in the birth of the Minotaur. Theseus and Ariadne, the second movement, moves us to the event in which Theseus, son of Aegeus, asks his father to send him to Crete as part of the 7 men and women who would be killed at the hands of the Minotaur. The Labyrinth, the third movement, begins with a grand opening describing the building built by Daedalus and culminates after an intense and deadly battle between Theseus and the Minotaur and the victory of Theseus and his heroic exit. premiere: Minotaurus has not yet had a public premiere. The Night of Samhain, known as Oíche Shamhna (Samhain Eve) among the Irish and the older reference of Oidhche Shamhna among the Scots, is a festival that marks the end of the harvest season and beginning of winter or the "darker half" of the year. It is celebrated from sunset on October 31 until the evening of November 1, which is about halfway between the autumnal equinox and the winter solstice. Oíche Shamhna is mentioned in some early Irish literature and is known to have pre-Christian roots. Many important events in Irish mythology occur or begin in Oidhche Shamhna. This festival was seen as a liminal time, when spirits could more easily enter our world. It was also believed that the souls of the dead returned on that night to visit their homes. This concerto is intended to illustrate the Night of Samhain and the process of preparation and consummation of that festivity. The first movement, marked Allegretto, muy molesto, sarcástico y cínico and then Andante moderato, oscuro, muy sensual, lujurioso, describes the preparatory process and the announcement of the setting sun. The second movement, marked Larghetto, amoroso, sublime, con arrepentimiento and then Subito Andantino, con enojo y confución, is linked to the first movement and presents the arrival of the deep night and with this the spiritual authorities and all its manifestations. The third movement, marked at the beginning Vivace, con furia, salvagismo y bravura, manifests the height of the festivity and nearing end with the arrival of dawn. After the advent of the Sun, marked Adagio, muy sentimental, amoroso, lleno de luz, the opening theme of the first movement is cited to emphasize that these entities will visit next year. premiere: Oidhche Shamhna has not yet had a public premiere. The Gran Trio is a concertante piece of absolute music commissioned by the Asociación de Padre y Amigos de las Orquestas Secundarias y Superiores, Inc. (APAOSS) for the three winners of their Ricardo Morales Saez Scholarship. premiere: Gran Trio for Flute, Violin, Cello and Orchestra received its premiere in 2012 by Kristalis Sotomayor, flute; Elisa García, violin; and Kevin Díaz, cello with the Ernesto Ramos Antonini Symphony Orchestra led by Iván Enrique Rodríguez as conductor in the Jesús María Sanromá Symphony Hall at the Conservatorio de Música de Puerto Rico.